Perfectly Created Chaos! 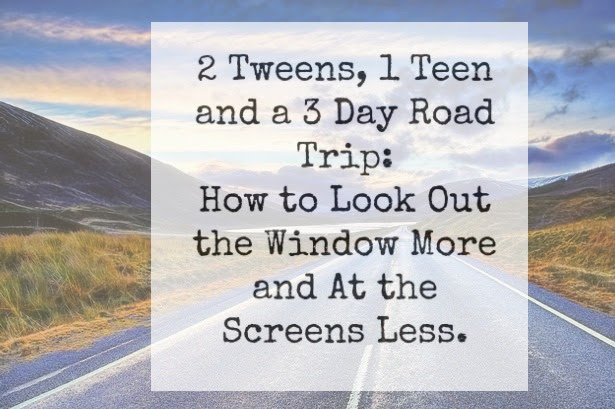 : 2 Tweens, 1 Teen and a 3 day Road Trip: How to look out of the window more and at the screens less. 2 Tweens, 1 Teen and a 3 day Road Trip: How to look out of the window more and at the screens less. Yes, I'm blogging...still...I think I was just having a bad day last week. So anyways onward and upwards. We are leaving Friday to visit family and friends in Iowa. It should take us roughly 2 1/2-3 days to travel from CA to IA. We plan to make some stops along the way. We have travelled a lot over the years as a family and usually the scenario is this: The teenager sleeps the whole time with her headphones in, the two boys sit in the back playing electronics and the dog pants like he's having hot flashes the entire way. Meanwhile, my husband and I sit in the front and talk, or sometimes don't...I read or play games on my ipad. Not a whole lot of family interaction going on during these journeys. This time, however, I really wanted to encourage the kids to look out of the windows a little more often and a little less at the screens. I would never ban the electronic devices completely...I'm motivated, not crazy! Today I thought I would share with you a few ways I plan to make this road trip more successful than those from the past. I hope you find some inspiration for your next family road trip. 1. Snack Boxes: I have 3 healthy growing kids who love to snack. The last time we traveled, I made these individual snack boxes and they loved it, so I decided to do it again! This is really helpful for me as a mom too because then I don't have to find space for all the boxes for the snacks; and they're not arguing about who ate the last whatever. Full disclosure, I am not the healthiest snack packer for road trips; but you know...that's the fun of it a little bit, I think. So, yeah there are potato chips and chocolate covered granola bars and cookies in there. I didn't want to have to worry about keeping fruit cold or yogurts spoiling or things like that. 2. Pre-plan Snacks: Not only did I pack individual boxes for everyone, I also pre-prepped snack bags for Saturday and Sunday as well. I will restock the snack boxes each day from these bags. By packing snacks for each day, you can really avoid extra cost as well. It seems like every time we stop to get gas, everyone wants food and drinks too. This way you can just limit it to a drink if you need to. I do plan to take drinks in a small cooler as well though. Road Trip Scavenger Hunt: I made a list of 50 items for them to find as we're traveling down the road. Some will be while we are in the car, some are for when we stop. Some are super easy, and some are more challenging. This game is completely customizeable. You can put as many items as you want. If you have younger kids you can do pictures as well. Odd Color Car Game. When we start our journey each child will pick an odd color for a car, like orange or yellow or lime green etc. As we're traveling, if you see a car that is the color you chose, you write it down and you get 5 points. However, if you see a color that belongs to someone else and they don't see it, you can "steal it" and get 10 points! Would You Rather? Easy and classic game that encourages great conversation and discussion between family members. I found some questions online at LandeeLu I printed the sheets out, cut them up into little strips and then put them into a small Tupperware container. Taboo Word Game: You'll notice in the picture with the folders that there are some paper clips strung together. These are paperclip "necklaces" for the Taboo Word Game. If you've been to a baby shower you've probably played a version of this game with "baby" being the taboo word. I've picked three words that are "taboo" for each day. If you say the word, you have to give up a paper clip. Whoever has the most paper clips at the end of each day wins the prize! (Again, I have no idea what it is yet) Obviously, for this game, you have to reset the paper clips each day.). So there you have it, a few fun and hopefully inspiring ideas for you and your next family road trip. I hope you have a great day! I have a few posts pre-planned and scheduled for you; but I will be back full time and at it in a few weeks! Have a great day, keep enjoying your summer and I'll see you all again soon! Looks like you've got a great plan for your road trip! Scavenger hunts are always fun. Enjoy your trip and safe travels! I'm really pleased that you have had a change of heart, you have certainly been busy and are so well prepared - I will be interested to hear how it goes.